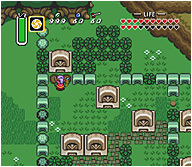 Not many know that the Rupee Men from most Zelda games did indeed make an appearance in A Link to the Past. There were only two and they were not the familiar "old men" but actually depicted as "thieves". Both give you the same amount of cash if you talk to them - 300 Rupees. Plus whatever's in the chests located behind them. The first Rupee Man is located in the Light World. Go south through the Swamp and take the south-eastern exit towards the river. Before you enter another scene, travel along the northern wall and you'll find this cave, just to the left of the river. It will look like a loose rock, not the typical crack, but you can still bomb it to make an entrance. The second one is in the Dark World. Enter the Marsh just below the Bomb Shop and in the same scene, head towards the right wall and look upwards into this tiny crevice. You will see a small crack in the wall that you will need to bomb. 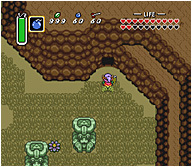 Once you have talked to the theif, don't forget to bomb the wall behind him to find his storage of chests with even more Rupees. In the game there are a lot of "secrets" within some buildings. Below is listed the places that are sure to pay you off really well. 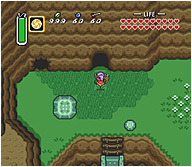 Whether you decide to go through all of Hyrule Castle's sewers again, or decide to take the quick entrance through the Cemetary's north-west tombstone, head back to the huge well lighted room you saw back at the beginning of the game when you were rescuing Zelda. Back then, you didn't have Bombs or Pegasus Boots, but now that you do, go investigate those strange cracks in the wall that you saw. One of the chests hidden in this secret room is sure to make you very happy. This is the first of two houses in the Village of Outcasts that houses a chest. It's not much of a secret, since the chest is just sitting inside, but some people I guess are too lazy to check inside the houses. This one is located on the eastern side of the village. The second house mentioned above should be fairly familiar. In the Light World it is a shop. In the Dark World, it's closed off. You have to open it up with a bomb. It's a tight fit inside, but it's worth it. Wait, what... you are still looking for money even when the secrets above should have given you a total of 1500 Rupees? Wow, big spenders, aren't we. Don't worry, even more secrets. One that's sure to keep you coming back for more, even. This is the #1 biggest secret. Not because it gives you the biggest pay off (it only gives you 100 Rupees) but you can do it whenever and as many times as you want for quick money. Go to the eastern ice cave, where you went to find the Ice Rod, and go inside the cave Link is facing in the picture. Once inside, you will see a Fairy Statue. Make sure to have a bottle free. Ram into the statue and use your bug net to catch a glowing bee! It's the mysterous Magic Bee! Take it to the Bottle Salesman in Kakariko Village, release it and talk to him. He will pay you 100 Rupees for it! 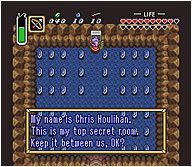 Ok, ok, this secret only gives you 20 Rupees, but it's funny and surprisingly, not many people notice it. 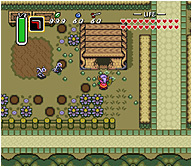 In Kakariko Village, enter the house on the left side of town where one of the "Cry-Thief" ladies reside. Go inside and look at the picture. It's a Mario Cameo! 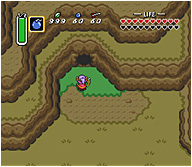 And usually in most Zelda games, whenever there's a Mario Cameo, there's a secret Rupee to be gotten. All you have to do is pull on the picture.